The police have paraded a suspected r*pist, Chidi Okoye Christian, who allegedly r*ped female students of Ekiti State University (EKSU). 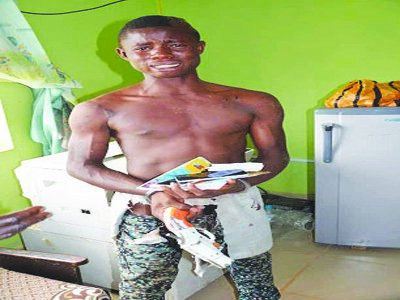 The 18-year-old Okoye has been on the wanted list of EKSU Security Unit for some time following attacks on students living off campus before he was nabbed. The suspect, who is not a student of the university, was arrested and paraded with his accomplice, Odunmbaku Kayode. Items recovered from Okoye included smart phones, ATM cards, a Raleigh bicycle, a cutlass and a pistol. Speaking at Iworoko Divisional Headquarters, Chief Security Officer at EKSU Captain Tunde Ajayi (rtd), said seven students had been r*ped by Okoye in the last three months. Ajayi, who was with the Investigating officer, said most of the victims live in nearby Iworoko. The duo will be charged to court as soon as police conclude investigation.